Needle shipped to domestic customers today, you should start receiving it next week. We’ll be emailing tracking numbers out by the weekend. International orders should go out the second week of January. Be sure to write a review once you get it. Happy new year, and stick them with the pointy end. Needle will start to ship the week after Christmas to domestic people, and the week after that (we hope) for International people. If you’ve moved or otherwise need an address change and have not yet gotten one, now is the time to tell us. 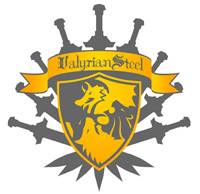 Email us at sales at valyriansteel dot com with your order information to change your address. Longclaw, by the way, can still be ordered for Christmas delivery, even with ground shipping if you live close to Michigan or close to California (the two places from where it ships) but for everywhere, up until 12/23, with air shipping. Because we are now in December, we have turned on domestic air shipping for Longclaw. So if you need it quickly, as late as 2 PM Eastern on the 23rd for Christmas delivery, you can order it with this method and have it arrive in time. Order Longclaw here to get it shipped by air, note, you need to order it from that specific page to be able to access the air shipping option. And this is for domestic orders only. International orders really need to be placed by the second week of December for any chance at Christmas delivery.